The Obstacle Jungle Slide is a huge slide. The slide is pretty steep and the kids slide down and stop against an inflated wall. The entrance to the slide is through a hole in a wall and then climbing past two palm trees. They ten climb the cargo net and slide down to the front. 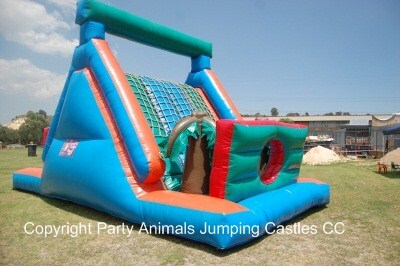 This castle is also popular for School Events, Team Building Events and even Corporate year end events. Colours: Dark Green, Spec Blue and Orange. Dimensions: 10m in length, 4m in width and 4m in height. Motor is a 1.1kw motor with a 15m extension lead. If your power point is further than 15m from where the castle will be placed, you will need to supply an additional extension lead. These are not provided by Party Animals.